Today's necktie is a Robert Talbott Studio. It's probably the first Talbott that I acquired. I remember thinking the picture on Ebay sure was a lot different than the tie I had in my hands when I received it. It's a little wild for my more sedate tastes but I've really grown to like it quite a lot. The mix of colors alone make it easy to conglomerate. The big shapes make it easy to pair up with just about any dress shirt I own. I think I almost have. I've never paired it with a white shirt though because I think it would be unfair to the tie. Hopefully that'll be this week's only personification of neckwear. Today's dress shirt is a navy and red windowpane pinpoint spread collar. It was an easy pick with the red and navy in the tie. I went with the tan sport coat because I picked olive trousers. I wasn't sure about how the trousers would match up with the navy sport coat. 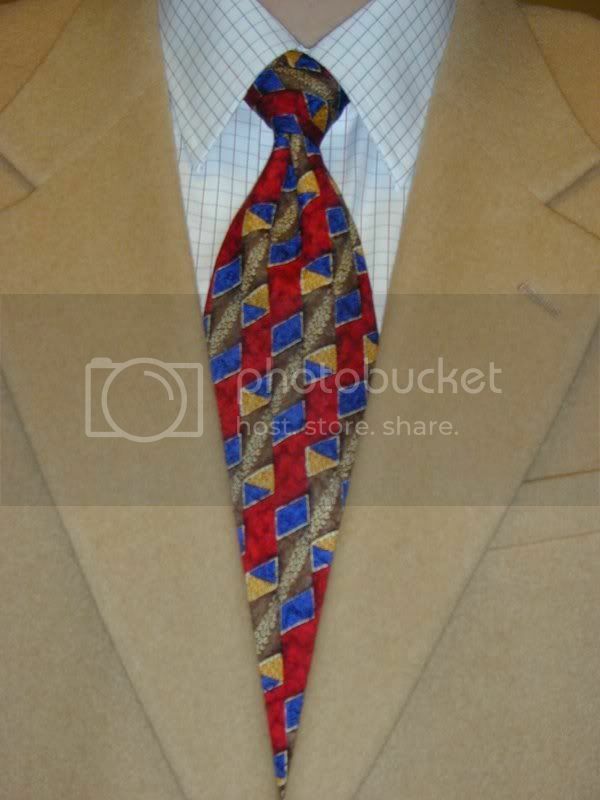 Most of the time I figure if the tie has the color on it then I can go ahead and conglomerate it in. Today I decided not to to push it. I found an article from yesterday's LA Times that laments the death of the necktie. It's an interesting enough read and can be found here. Obviously I don't agree with him. I think if he spent a little time with a few blogs he might find that neckites are alive and well.